Chicago is, as one writer put it, a “city of travelers.”1 The city’s sheer sprawl made that moniker inevitable. It also led to the creation of a transportation system that, at its apogee, consisted of a web of streetcars, diesel buses, electrified trolleybuses and elevated railways and subways. But not every mode of public transportation that once served Chicago is extant today. Streetcars, for example, last operated in Chicago in June 1958, and trolleybuses retracted their trolley-wire poles for the last time in March 1973. As those modes of transportation disappeared, the infrastructure that supported it was eventually demolished as well. The “L,” by contrast, is obviously still alive and well in Chicago. But that does not mean all parts of the “L” that once existed still exist today. After the Chicago Transit Authority (CTA) assumed operational control of the “L” in 1947, it abandoned and ultimately demolished seven entire lines and branches. Although CTA largely eliminated even the slightest trace of these structures in the 1950s and 1960s, some remnants still exist today. This article documents some of the known physical remains of that long-gone rail infrastructure. Called the “Alley L” because its route was completely through city-owned alleys,10 the South Side Rapid Transit line was Chicago’s first experience with bona fide intracity rail service. It would, of course, not be the last. In the years that followed, several competing, privately-owned rail lines began service in different areas of Chicago: the Lake Street Elevated Railroad Company (1893);11 the Metropolitan West Side Elevated Railroad Company (1895);12 the Union Elevated Railroad Company (1895);13 and the Northwestern Elevated Railroad Company (1899).14 These purely private concerns built much of the infrastructure for the CTA rail lines we now know as the Red, Blue, Green, Brown and Pink Lines. By 1909, after each of these companies had significantly expanded their operations, they were jointly capable of serving large swaths of the city’s neighborhoods and as well as its then-outlying and undeveloped “prairie” areas. In what might now be considered a short-sighted decision, CTA did not just discontinue services on those lines and branches; it had their supporting physical infrastructure completely demolished. Just how completely CTA removed that infrastructure is the focus of this article. But owing to the apparent thoroughness of the contractors CTA engaged to dismantle these lines or the development of the former rights of way for other uses, there are few remnants of those structures. The elevated section of the Blue Line from Wolcott Avenue to Linden Place is all that physically remains of the Logan Square Branch of the Metropolitan West Side Elevated. The Logan Square Branch was originally a much larger and entirely elevated structure; until February 1951, there was no subway starting at Division Street as there is today. As the CRT map from 1946 (left) illustrates, the Logan Square Branch commenced at the Marshfield Junction (Marshfield Avenue, between Van Buren and Congress streets; demolished), proceeded via an elevated rail structure north along a right-of-way just to the west of Paulina Street, and then turned to the northwest just south of Milwaukee Avenue at Moorman Street, where it traveled parallel to Milwaukee and terminated at the Logan Square station (2525 N. Kedzie Avenue; demolished). Paulina Street looking west, circa early 1940s. The original Paulina elevated, with its gradual curve towards the south, is shown here prior to the completion of the Milwaukee-Dearborn Subway. The subway portal, which is in the foreground, was left unfinished pending the end of World War II. Left: Historic Aerials; Right: G. Krambles, Krambles-Peterson Archive. Evergreen Junction then and now. Left: 1962 aerial view of the Evergreen Junction. The emergence of the 1950-era elevated tracks from the junction is visible. Right: Modern aerial view of the structural remains of the Evergreen Junction. The outer tracks of the elevated structure were supported by the additional steelwork shown here jutting out on both sides. An apparently disused substation (not visible), which we assume powered the Evergreen Junction, is directly beneath. Demolition of the abandoned elevated structure between Lake Street and the Evergreen Junction, circa December 1964. Workers remove the elevated structure at Grand Avenue and Paulina Street (left) and in the alley at Ohio and Paulina streets (right). 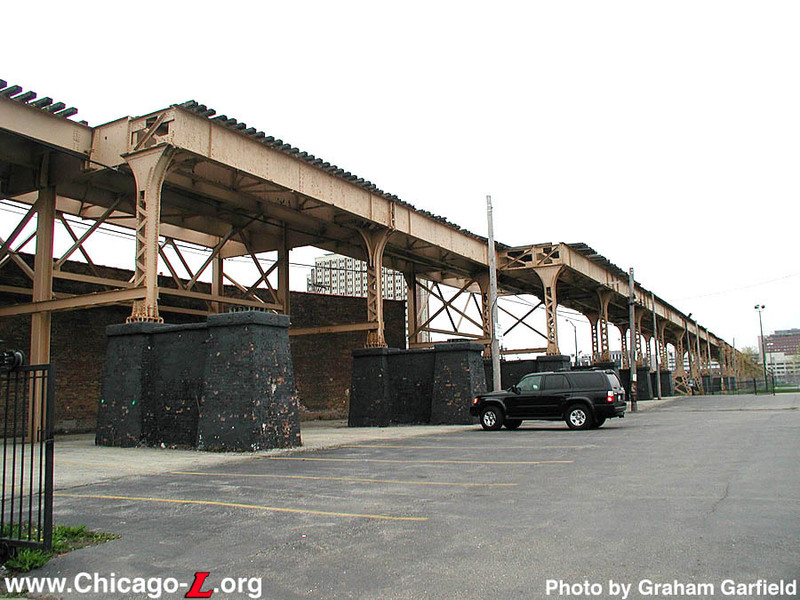 There are several remnants of the now-demolished elevated alignment of the Logan Square Branch. The survey below begins at the site of the former Evergreen Junction, proceeds southeast and south toward Lake Street and ends at the site of the former Washington Junction. Left: Street-level view of Evergreen Junction. The widened structural support for the additional southern outer track is evident here. Right: The foreground of this picture features one of many square concrete pads on the south side of the elevated structure/subway portal between Wolcott and Hermitage avenues. Each of these pads was the foundation for a vertical girder of the now-demolished elevated structure that was erected on either side of the new subway between 1946 and 1950. Note that each concrete foundation pad is directly opposite a severed girder. Left: The alley behind the Walgreens at Wolcott Avenue, looking east. This view illustrates the severed girder on the subway portal (upper right) and what remains of the concrete base for the now-removed opposite vertical support girder (lower left). Right: Another pairing of a concrete pad and severed support girder for the elevated trackage near the subway entrance. Shortly past this point, the 1950-era elevated structure turned to the southeast near Moorman Street and connected with the 1895-era Paulina elevated. Left: Sanborn; Right: Google Maps. Moorman Street then and now. Left: Sanborn fire insurance map circa 1950 showing how the elevated section of the Logan Square Branch curved to the southeast, away from the subway portal. Right: A modern overhead view of roughly the same location. The oddly shaped buildings and large setbacks in this area, particularly along the 1200 block of North Paulina, evidence the elevated structure’s former right-of-way. There are precious few remnants of the demolished permanent elevated structure south of Moorman Street. Left: This is a rare example indeed: an entire vacant lot of concrete bases for the elevated structure that formerly passed overhead at approximately 1714 W. Ohio Street. Middle: An overhead view of 1714 W. Ohio Street in 1962 showing the elevated structure. Right: Roughly the same perspective today. The concrete bases appear as white dots from this elevation. Left: Further south, there is a severed support girder embedded in concrete in an alley to the north of about 1715 W. Chicago Ave. The squat, yellow former CRT building (discussed below) is visible in the distance. Note that the severed girder is directly aligned with the old CRT building, evidencing the elevated structure’s former right-of-way. Right: Detail of severed girder in alley to the north of 1715 W. Chicago Ave.
Commercial building at approximately 1715-17 W. Chicago Ave. The squat construction owes to the fact that the elevated tracks passed directly above the building. It is believed to have been operated by CRT. Continuing to the south, the elevated structure crossed over the Chicago & Northwestern and Milwaukee Road railway right-of-way at Kinzie Street. This was accomplished by way of a large steel bridge — sometimes called the “Met” bridge — that remains extant today, and is likely the largest “‘L’ remnant.” Although essentially abandoned in place in that it no longer serves as a bridge, today it acts as a signal tower for rail lines that continue to operate below. Left: Overhead view of the bridge in service in 1962. The elevated tracks are clearly visible at the top and bottom of the picture. Middle: Roughly the same overhead view today. Right: Street-level view of the bridge. Left: J.J. Buckley; Right: B.L. Stone; both from the Krambles-Peterson Archive. Left: Overhead view of Washington Junction in 1962. Note that there are two parallel spans of elevated trackage. The left set of tracks is part of the former Logan Square Branch, while the right set is the alignment CTA added in 1954 to connect the Douglas Line to the Lake Line. Center: Modern overheard view of the former Washington Junction. The structure’s curve belays the one-time existence of the Logan Square tracks which, as discussed above, were demolished beginning in 1964. Sanborn fire insurance map circa 1950 showing Damen Junction, the point at which the Humboldt Park Branch joined with the Logan Square Branch. After identifying the stations and lines that were most uneconomical and had the lowest ridership, CTA had decided in early 1951 to abandon the line entirely coincident with the opening of the Milwaukee-Dearborn Subway in February 1951. CTA’s plans for outright abandonment were derailed, however, when affected residents and their alderman objected. CTA compromised by demoting the Humboldt Park Branch to a mere shuttle between Lawndale and Damen. This meant its trips into the Loop were over: Humboldt Park passengers now had to disembark at Damen Junction (as the Logan-Humboldt rail junction was called), walk along a catwalk to Damen station and transfer to the Logan Square Branch.39 But the branch’s stay of execution was short lived. From this now-demolished tower, CRT and CTA employees would monitor activity at the Damen Junction. This photograph was likely taken in 1952, during the Humboldt Park Branch’s final days. The astute observer can still see the painted wall ad beginning with “North …” as Blue Line trains arrive at and depart from the Damen station. Very few remnants of the Humboldt Park Branch remain. Perhaps its most prevalent remnant is the vacated right-of-way between Damen and Lawndale avenues. Although much of that land has been developed or dedicated to other uses, several sections of the branch’s former right-of-way appear oddly vacant and, as such, are ghostly reminders of the structure’s one-time presence, such as this example at Fairfield Avenue (left). Right: The staggered angles of this old commercial building evidence the Humboldt Park Branch’s right-of-way, as the extra space they created provided the clearance necessary for the elevated structure to curve away from the Logan Square Branch and proceed west. These concrete and iron squares just to the northwest of Damen station are located at the site of the former Damen Junction. Because of their location and exact alignment with the vertical girders of the extant Blue Line structure, these objects are likely remnants of the footings for part of Damen Junction’s structural support. The vacated right-of-way is particularly evident in the left image. Left: This image from a Sanborn fire insurance map circa 1950 illustrates how the Humboldt Park Branch passed above the former CRT building located at about 1614 N. Kedzie Avenue. Center: Detail of the former CRT building’s southern exterior wall. Note that a vertical steel girder — that once supported the elevated structure that passed overhead — remains embedded in the masonry. Two stops west of Kedzie station was the Humboldt Park Branch’s terminal at Lawndale Avenue. Left: Although nothing of the terminal itself remains (a car wash occupies the site), the branch’s electrical substation remains extant about 150 feet to the east, in the path of the branch’s former right-of-way. Right: This image from the Sanborn fire insurance map circa 1950 situates the Lawndale Substation under the elevated tracks. The Wells Street Terminal in September 1953. The rear of the terminal’s façade is in the distance. The extant substation, shown below, was beneath the elevated structure, closer to the terminal itself. Left: Although this concrete parking garage now occupies the place where Wells Street Terminal once stood, the Franklin Street Substation survived demolition and remains extant today. This substation was situated behind Wells Street Terminal, beneath the tracks. Today, it provides power to the Loop Elevated.51 Right: Detail of one the footings for the former elevated structure that led away from Wells Street Terminal and over the Franklin Street Substation. As its name implies, the Stock Yards Branch was built for a single purpose: to provide passenger rail service within the sprawling, 320-acre Union Stock Yards, Chicago’s meat-packing district. As illustrated on CRT’s 1946 map (left), the Stock Yards Branch was a seven-station stub that connected with the other parts of the South Side Elevated (i.e., today’s Green Line) at Indiana. From Indiana, the branch proceeded westward toward the Stock Yards, which it reached at approximately 4100 south. The track then made a loop in the “Packingtown” part of the yards and headed back toward Indiana station.52 After a few devastating fires and the decline of the Stock Yards themselves, CTA discontinued all service on the Stock Yards Branch on October 6, 1957.53 The steel elevated structure itself was dismantled sometime thereafter. Although severed girders were once visible in area sidewalks, almost no remnants of the Stock Yards Branch exist today. However, at least one structure evidences the branch’s former right-of-way at the site of where its Halsted station once stood. Left: Aerial view of the Stock Yards Branch’s Halsted station, circa 1952. Right: A modern-day aerial view of the same location. The Stock Yard Branch’s right-of-way is evident in the angle of the building that was once to its north. Left: Google Maps; Right: G. Krambles, Krambles-Peterson Archive. Homan station, however, survived the station closures of 1948. Homan — which was originally called “Garfield Park” — was similar to the other stations that Lake Street Elevated Railway Company built in the early 1890s.57 Designed in the Queen Anne style that was popular in the United States from 1880 to 1910,58 but enhanced with a touch of Gothic Revival, Homan station would have fit perfectly within a cityscape of architecturally similar structures, such as the “tied houses” that Schlitz was building all around Chicago around the same time. Homan station featured two station houses, which showcased the Queen Anne/Gothic Revival styling, as well as boarding platforms on either side for inbound and outbound trains.59 The structural support for the station houses came from four vertical girders with bases embedded in the sidewalk, near the edge of the curb. Homan station then and now. Left: Homan station in 1985, looking north. In addition to the architectural elements discussed above, two of the four girders that provided vertical support for the station house are shown here, just at the edge of either curb. Right: A modern view of where Homan station once stood, looking south. All that remains of the architectural splendor that once graced this intersection are the two columns that supported the north station house. While obviously “remnants” within the scope of this feature, these former stations are already very well documented on Graham Garfield’s website: Chicago-L.org. Accordingly, we do not address them here, and instead invite you to follow the links to that website in the above table. The author thanks: Graham Garfield, for fielding my many questions; Serhii Chrucky, for taking photographs and providing overall guidance; Art Peterson, for granting me access to the Krambles-Peterson Archive; the Chicago Transit Authority, for granting me permission to use its historical photographs and route maps; and last but not least Katherine Banich, for proofreading this article and generally being patient. 1. Williams, Michael, Richard Cahan, and Bruce Moffat. Chicago: City on the Move. Chicago: Cityfiles, 2007. 14. Print. 2. We include this brief historical overview of the history of rail transit in Chicago only to provide context for the remnants discussed herein. For a much more comprehensive examination of that subject, we recommend you visit Graham Garfield’s website, Chicago-L.org. 3. Krambles, George and Art Peterson. CTA at 45: A History of the First 45 Years of the Chicago Transit Authority. Oak Park: George Krambles Transit Scholarship Fund, 1993. 1. Print. Act of March 4, 1837, 1837 Ill. Laws 50; United States v. City of Chicago, 48 U.S. (7 How.) 185, 186 (1849). 6. Garfield, Graham. “Chicago ‘L’.org: History – The Original ‘L’ Lines.” Chicago ”L”.org. Web. 16 Oct. 2010. 7. Williams 50; Krambles 21. 10. Garfield, “The Original ‘L’ Lines”; Krambles 21. 16. Garfield, Graham. “Chicago ‘L’.org: History – Unification.” Chicago ”L”.org. Web. 16 Oct. 2010. 17. Krambles 7. This remained so right up to the end of private ownership of CRT as well as Chicago Surface Lines, which operated the city’s streetcars. From about 1938 until the day CTA took over in 1947, both CRT and CSL were debtors in bankruptcy, with their operations subject to the superintendence of United States District Judge Michael L. Igoe. “City’s Traction Lines Merged for New Epoch.” Chicago Daily Tribune [Chicago] 1 Oct. 1947: __. Print. 20. Metropolitan Transit Authority Act, 1945 Ill. Laws 1171, now codified at 70 ILCS 3605/1 et seq. 22. Krambles 9. Garfield, Graham. “Chicago ‘L’.org: Operations – Lines –> Humboldt Park.” Chicago ”L”.org. Web. 16 Oct. 2010. 24. Garfield, Graham. “Chicago ‘L’.org: Operations – Lines –> Lake Branch.” Chicago ”L”.org. Web. 5 June 2011. 27. “1st Trains Run In New Subway Saturday Night.” Chicago Tribune [Chicago] 18 Feb. 1951: 21. Print. 28. Garfield, Graham. “Pictures for Forgotten Chicago Feature.” Messages to the author. 23 May 2011 and 12 June 2011. E-mail. 29. Garfield, Graham. “Chicago ‘L’.org: Towers & Junctions – Evergreen Junction.” Chicago ”L”.org. Web. 8 May 2011. Garfield, Graham. “Chicago ‘L’.org: Operations – Lines –> Milwaukee-Dearborn Subway.” Chicago ”L”.org. Web. 8 May 2011. 30. Garfield, Graham. “Pictures for Forgotten Chicago Feature.” Message to the author. 12 June 2011. E-mail. 31. “Plan Group OK’s Razing CTA Station.” Chicago Tribune [Chicago] 27 Feb. 1964: W1. Print. 32. “Five Contracts Awarded at Board Meeting.” CTA Transit News (Sept. 1964): 3. Print. 33. “69 Year-Old Logan ‘L’ Structure Being Scrapped.” CTA Transit News (Dec. 1964): 4. Print. 34. Garfield, Graham. “Chicago ‘L’.org: Towers & Junctions – Washington Junction.” Chicago ”L”.org. Web. 20 May 2011. 35. Garfield, “Washington Junction.” Garfield, Graham. “Chicago ‘L’.org: Operations – Lines –> Cermak Branch.” Chicago ”L”.org. Web. 30 May 2011. 36. Garfield, Graham. “Chicago ‘L’.org: Operations – Lines –> Paulina Connector.” Chicago ”L”.org. Web. 20 May 2011. 40. “CTA’s Trimming of ‘L’ Branches Draws Near End.” Chicago Daily Tribune [Chicago] 21 Apr. 1953: A3. Print. Vandervoort, Bill. “Chicago Bus and Streetcar Routes.” Chicago Transit & Railfan Web Site. Web. 22 May 2011 (noting that North Avenue’s streetcar route was converted to trolleybuses on 3 July 1949). 41. “Humboldt Park ‘L’ Abolished by CTA Order.” Chicago Daily Tribune [Chicago] 16 Apr. 1952: B9. Print. 42. “Suit Demands Humboldt Park ‘L’ Be Restored.” Chicago Daily Tribune [Chicago] 6 May 1952: 4. Print. 43. “Humboldt Park ‘L’ Trains Discontinued Today; Put in Buses.” Chicago Daily Tribune [Chicago] 5 May 1952: 1. Print. 44. “Start Wrecking Last of Humboldt Park ‘L’.” Chicago Daily Tribune [Chicago] 4 Jul. 1961: 13. Print. 46. Garfield, Graham. “Chicago ‘L’.org: Stations – Wells Street Terminal.” Chicago ”L”.org. Web. 29 May 2011. 52. Garfield, Graham. “Chicago ‘L’.org: Operations – Lines –> Stock Yards.” Chicago ”L”.org. Web. 5 June 2011. 57. Garfield, Graham. “Chicago ‘L’.org: Stations – Homan.” Chicago ”L”.org. Web. 6 June 2011. 58. McAlester, Virginia, and Lee McAlester. A Field Guide to American Houses. New York: Alfred H. Knopf, 1984. 262-87. Print. 61. Garfield, Graham. “Chicago ‘L’.org: Stations -Conservatory.” Chicago ”L”.org. Web. 6 June 2011. 62. Garfield, Graham. “Chicago ‘L’.org: History – The CTA Takes Over (1947-1970).” Chicago ”L”.org. Web. 29 May 2011. This article was last updated on Saturday, July 2nd, 2011 at 6:35 pm.